Merit Badge University (MBU) is a bi-annual event hosted by the Boy Scouts of America, Alamo Area Council that gives Scouts, ages 11-17 the opportunity to earn merit badges ranging from recreational activities like photography and horsemanship to Eagle Scout required merit badges like communications and sustainability. Held in the months of May and November at a local college, it is MBU’s intent to create an environment where Scouts have an opportunity to continue their advancement program and earn valuable merit badges that may not be readily available elsewhere. It gives youth the opportunity to earn up to four merit badges in one day, while helping them on their path to earn their Eagle Scout rank and serve our community. 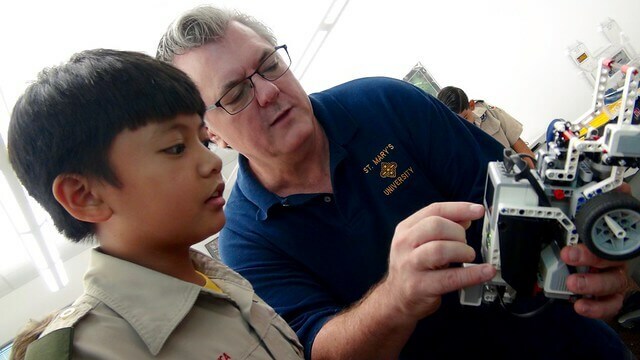 This event regularly draws over 900 Scouts and 400 parents and leaders. MBU uses a minimum of 60 classrooms and various other open or public spaces to create a great environment for learning. For the event itself, MBU is always held on a Saturday and formally starts at 8am and runs till 4pm. For the students the day is divided into four, 90 minute classes or periods, with a built in lunch in the middle of the day. All scheduling for the youth is handled by the MBU volunteer staff. Some Scouts have a full day of all 4 periods, while others will come in just to take one class. Due to the nature of some of the topics being taught some periods will be combined to last 3 hours. 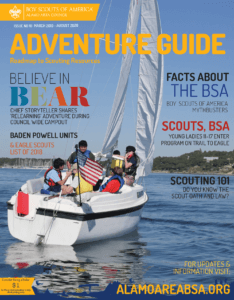 MBU also offers a full array of adult BSA training and other topics of interest to the Scout parents and leader. Over the years, MBU regularly brings in Scouts from all of south and central Texas, as far away as Laredo and Oklahoma. For more information, please contact MBU Team by email at MBU@AlamoAreaBSA.org. Winter Merit Badge Extravaganza (MBE) is a three day annual event in the month of December that gives Scouts BSA youth the opportunity to earn up to four merit badges ranging from recreational activites to Eagle Scout merit badges.